KENNEWICK, Wash. – Woodinville winemaker Brian Carter continued his impressive run of top awards from West Coast wine competitions as Brian Carter Cellars claimed best of show at the 37th annual Tri-Cities Wine Festival for the 2011 Byzance Red Wine. An international panel of judges was charmed by Carter’s GSM-style blend of Southern Rhône varieties, which leads with Grenache, includes Syrah, Mourvèdre, Counoise and Cinsault and features a significant influence from acclaimed StoneTree Vineyard on the Wahluke Slope. The wine ($45) also earned a double gold — denoting that it was a unanimous vote for a gold medal by the judges. Carter, a graduate of Oregon State University, topped the field of 428 entries and 80 participating wineries. Awards were announced Nov. 14, and every wine entered in the competition was required to be poured at a public event at the Three Rivers Convention Center in Kennewick. 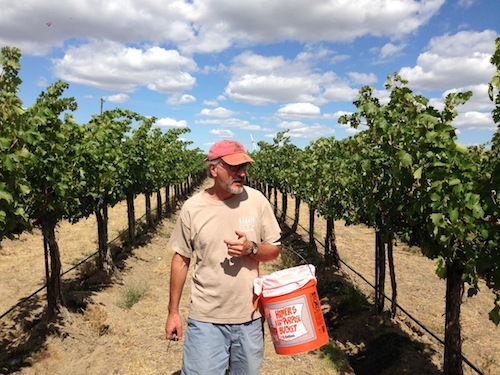 Brian Carter Cellars is Wine Press Northwest’s reigning Washington Winery of the Year, and its résumé included best of show awards at three Pacific Northwest judgings in 2014. Earlier this year, the 2011 Byzance earned a gold medal at the Pacific Rim International Wine Competition in San Bernardino, Calif.
Other top performers at the Tri-Cities Wine Festival included Coyote Canyon Winery with four double gold medals and four gold medals, Kiona Vineyards and Winery with four double gold medals and three gold medals, and Smasne Cellars for three double golds and six gold medals. Ancestry Cellars in Woodinville won four gold medals, including one for its 2013 Reminiscence Riesling. The prior vintage won best of show at the 2014 Tri-Cities Wine Fest. College Cellars, the winemaking program at Walla Walla Community College, won two double gold medals. Yakima Valley Vintners of Yakima Valley Community College amassed five gold medals. Northwest Wine Academy of South Seattle CC received a pair of gold medals.